We are living in the age of microbreweries, an exciting time for fans of specialty beers. Smaller breweries and pubs generally get their start on the local level where great word of mouth can be a business’s best ally. As they seek to expand, however, it’s essential to have an attractive, functional website that conveys their personality, as well as the quality of their products. Google is an amazing tool for both businesses and their customers. When a mobile device user searches for a specific business type, such as ‘brewery’ or ‘bar,’ the search engine will look for local matches. Getting on this list of search results is one of the best ways to get the word out about who and where you are. As you grow, you will also need to reach out to folks who are willing to travel a bit to visit your bar. As a brewery, your goal may be to expand into national or international distribution. The first step on all of these paths is a sleek website and WordPress can get you there. These bar and brewery WordPress themes will provide you with everything you need to succeed, from email marketing to social media. to help relieve some of the stress. There are some fantastic choices here, from themes with event management centers to others with incredible galleries to showcase the fun times to be had in your bar. Read on to learn more about the exciting options available. The Brew House WordPress theme is one of our top choices because it’s a modern, completely free theme with plenty of cool bar-based demo content to get you started. The theme is completely responsive for viewing on mobile devices and it provides a unique “tipsy” parallax effect. As with most parallax effects, these work well for simulating a creative environment and attracting eyes to a certain part of your homepage. The “tipsy” effect is even more impressive considering it goes along with the whole drinking industry. This clean and beautiful theme offers unlimited options for you to choose in terms of colors. This is perfect for matching your website with the rest of your brand. The Google Fonts selector comes out strong for companies that want to customize typography, while the XML sample content ensures you can make your own website look exactly like the demo. The documentation for the Brew House theme is fairly robust and all of the translation files makes it easy to market your microbrewery to an international audience. The admin panel presents a well-organized set of features and tools and the frontend has a hidden menu on the right side for users to click on when they would like to see it. The front page is filled with widget areas, turning your design experience into more of a drag-and-drop process. Several buttons are provided as calls to action and the beer list can be presented in a stunning format. Your menu has thumbnail images of the beers, along with descriptions and alcohol content information. Integrate a contact form for connecting with your customers through email and use the social media buttons to send interested parties over to places like Facebook and Twitter. Your contact information and hours are accessible to users in the footer, while the branded blog allows for updates on events, new beers, and menu changes. 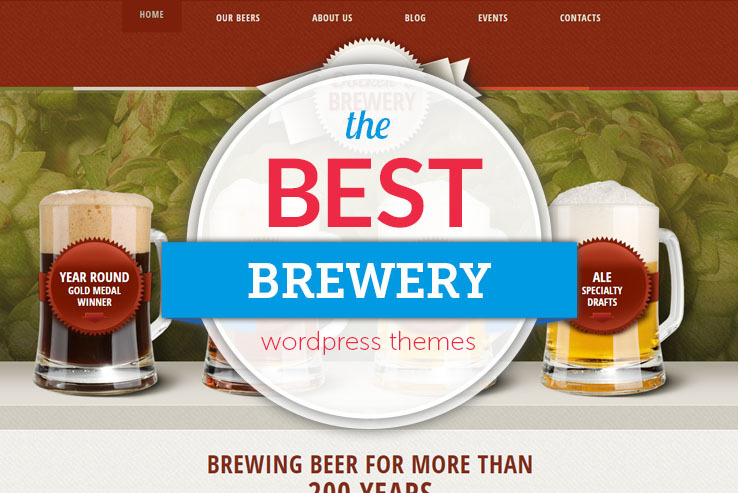 Along with a masonry style gallery, shortcodes for staying away from source code and some fancy post formats, the Brew House WordPress theme has a leg up compared to the competition. 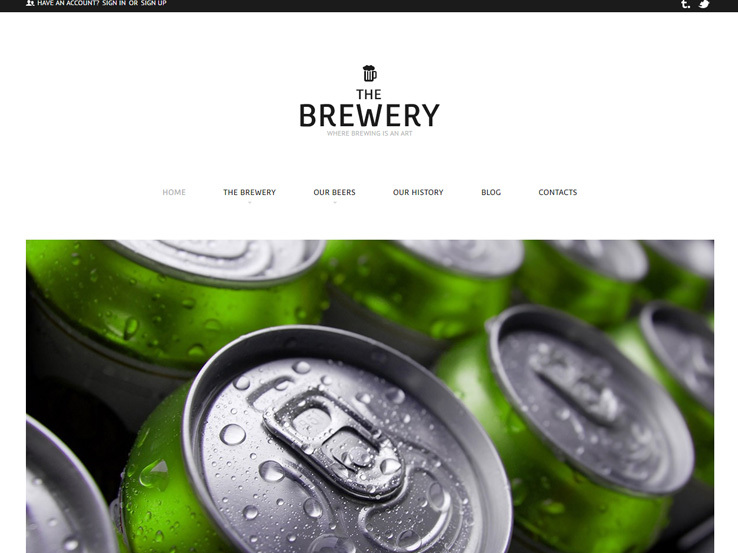 The Brewery WordPress theme has a more elegant take on the whole bar theme scene, with sleek lines, professional formats, and demo content that looks like it would fit more in the lines with a winery. That said, many bars and breweries are going for the classy look, so feel free to consider this theme if that sounds like your brewery. Custom post types are handy for adding variety to your site, while the responsive design meets the needs of your users since they are often more likely to bring up your site on a mobile device. This is a multilingual ready theme, and various shortcodes assist with quickly adding elements like tabs, lists, and buttons. What’s more is that the theme has a two-step installation and multiple color options. The filterable portfolio comes in handy if you’re trying to make a professional-looking list of your beers. In addition to that, custom typography is perfect for changing your fonts. 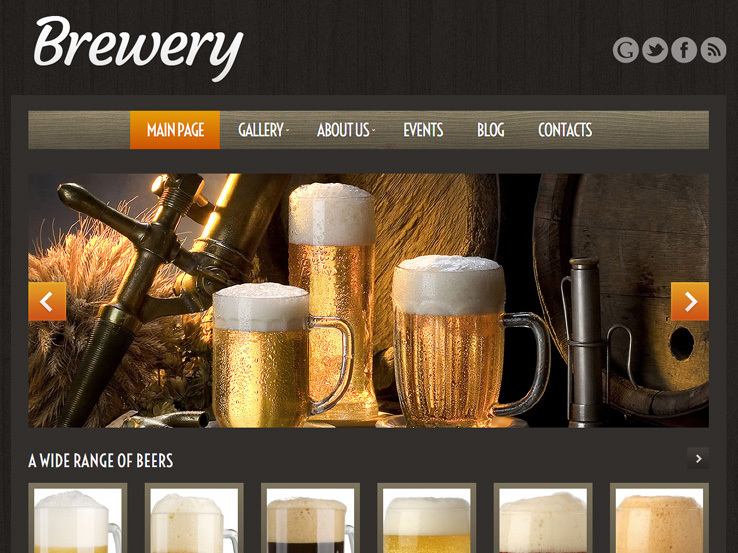 Brewery has a rather simple name, but it’s a solid WordPress theme. The layout is rather playful with the wooden background, however, you can easily change it if it’s not exactly your style. The header has some fringe along the menu for an improved design and there is also a spot to talk about your brewery with text and buttons. The main image area in the header is actually a slider, so if you’d like to upload high-resolution imagery to showcase your beers, the Brewery theme is a solid choice. The theme has a responsive design as well, allowing visitors to enjoy your website no matter which device they’re using. Everything is fully editable. If you’re a more experienced designer you can edit custom CSS. On the other hand, you can also take advantage of the backend tools for changing custom post types and colors. Some of the post formats include galleries, images, and quotes, so you have the ability to adjust what people see on the blog depending on the type of media you use. The multilingual nature of the theme goes along well with the translations, while the large portfolio may work nicely for a gallery of all your beers. Custom widgets are there for social sharing and comments, while the custom typography delivers a stunning way to show off your written words. 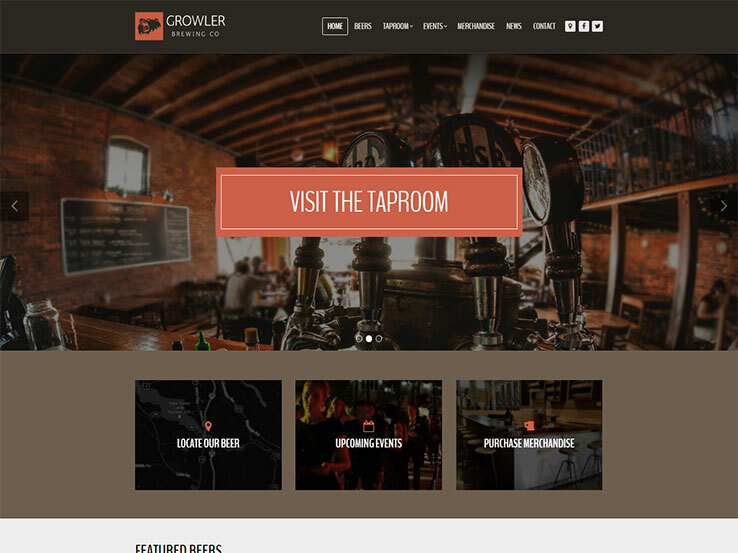 Growler is a sleek and stylish WordPress template for breweries and pubs who want to present their services and products without much hassle. The frontpage allows you to showcase your featured beers using a clickable image, along with a description and alcohol content information. Moreover, you can easily share your upcoming events along with a calendar thanks to the available events post type. The theme is eCommerce-ready, meaning you can easily set up an online shop to sell your merchandise. At the footer, you can add your location and contact information, opening hours as well as photos from your Flickr account. Other useful features include unlimited color schemes, Retina support, translation files and video documentation. 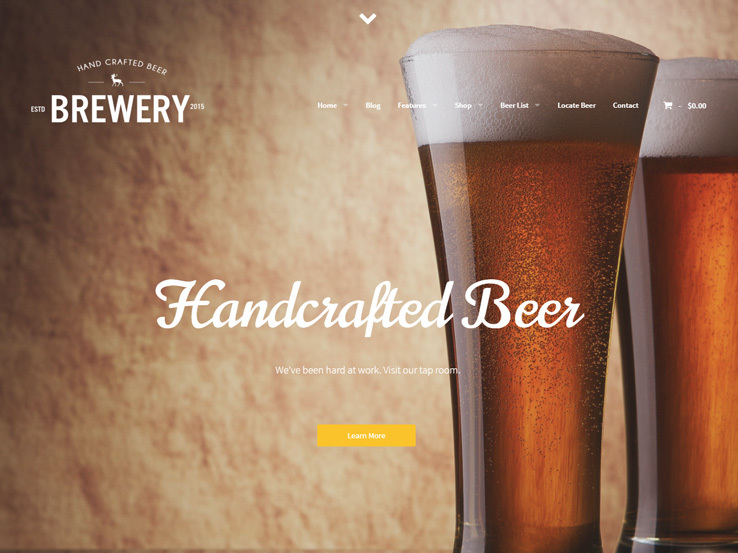 Would you like to market your brewery business with a unique, modern website? 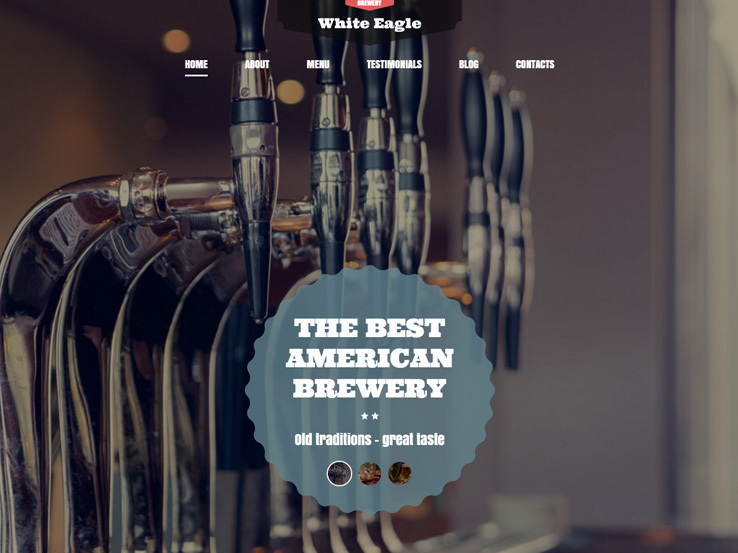 If yes, the stylish and colorful Best American Brewery WordPress theme might be just what you’re looking for. This template features a stunning design that includes an eye-catching image slider on the frontpage, a two-column Welcome section to display your welcome message, as well as a carousel menu section where you can feature your best beverages along with their prices. At the bottom of the home page there is a neat contact form so customers can easily reach out to you. Since the theme is fully editable, you can customize everything to match your style. Other features of this template include custom post types, a filterable portfolio, multiple color options and more. 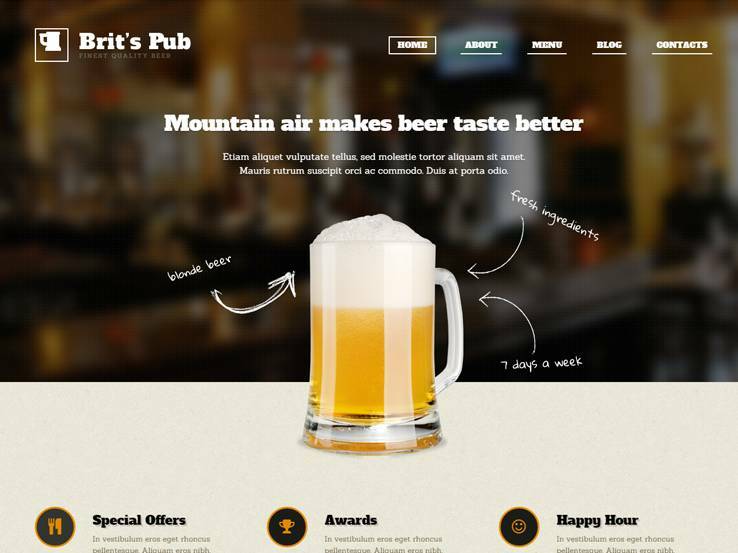 The Beer Pub WordPress theme provides a great website solution for breweries and pubs that would like to establish an effective online presence. The template features a cool and refreshing design with well-thought-out details. The frontpage includes a unique header design, along with sections to feature your gallery, opening hours, and map location. You also have a section to feature customer reviews. In addition, setting up and customizing the theme is a breeze, and helpful support from the developer is available in case you get stuck along the way. The Brewery WordPress comes with a fresh and modern look, along with useful functionality that makes it a great choice to build your pub or brewery site. The large frontpage slider is perfect for highlighting your most important messages, while the filterable portfolio provides the option to share images of your best beverages. You also get the ability to present your team members and customer testimonials, along with a blog section that allows to post updates of upcoming events, new beers, and more. Your contact information and social media links are accessible to visitors at the bottom. Other features include mega menu support, parallax effects and a 100% responsive design. 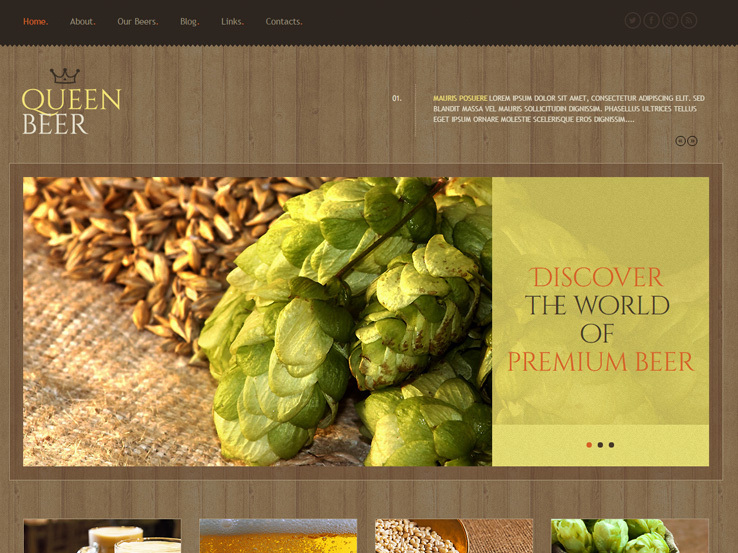 The Craft Beer WordPress theme is yet another awesome solution for brewery and pub sites. 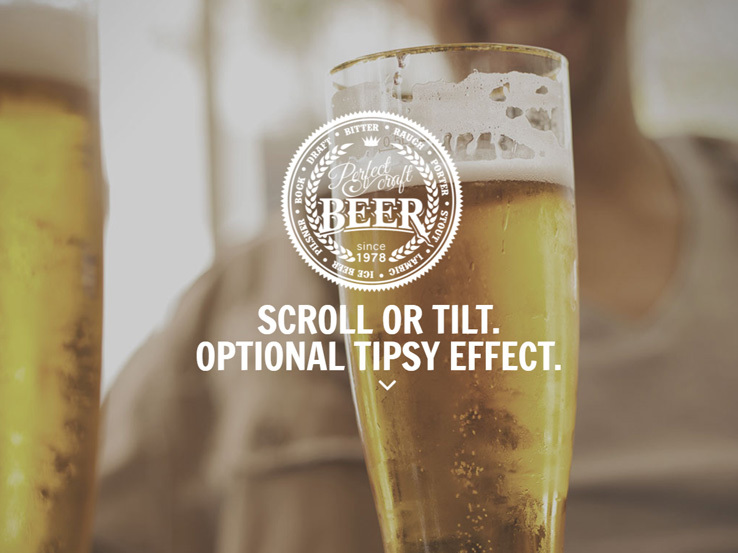 Just below the frontpage slider, you have a full-width carousel that enables you to feature your best beers. The images are clickable, so you can lead users to the detailed pages, thereby improving your user experience. The gallery allows you to show off your amazing imagery, while the blog section is perfect for sharing your upcoming events or news. The template integrates seamlessly with different social networks, so you can reach people on Facebook, Twitter, Google+, and more. Moreover, you get multiple color options to choose from, a filterable portfolio, custom widgets, free updates, and much more. 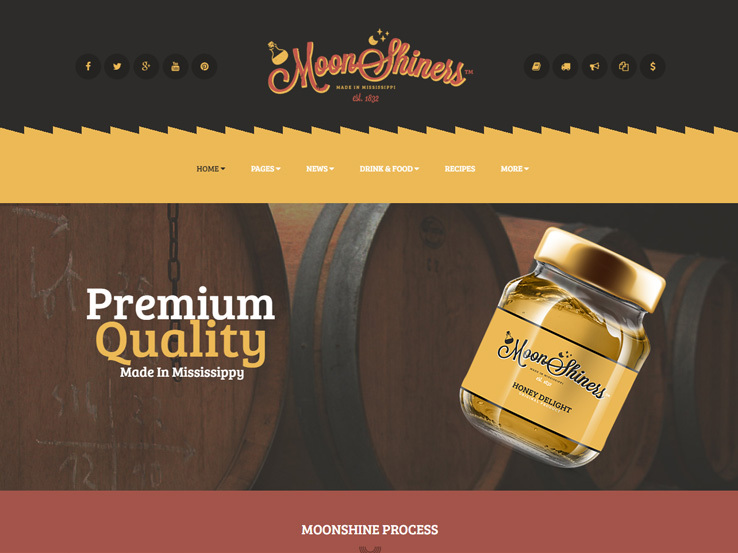 MoonShiners is a cool and creative WordPress template that offers a solid choice for breweries, brewpubs and distilleries. The theme comes with 3 homepage layouts, giving you great options to choose from. This template’s frontpage stands out from the other themes on this collection – you get the ability to add a video on the homepage, sections to feature your products, recipes, team members, partners, and more. Since the template is built on Twitter’s Bootstrap framework, adding visuals and other elements to your site will be easy. Other notable features include unlimited color options, translation ready, and the option for a boxed- or full-width layout. 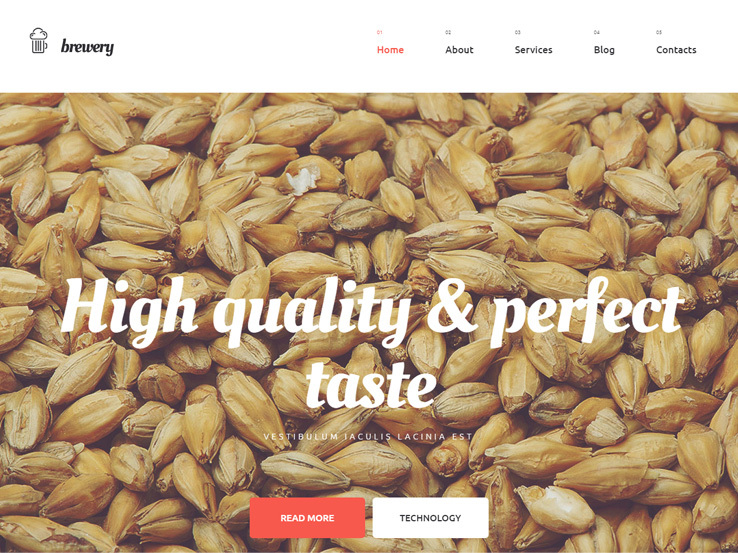 The Brewery WordPress Theme is a stylish and inviting template with stunning parallax and lazy load effects that will enhance the performance of your website. The frontpage features a fullscreen slider with overlaying call-to-action buttons, so you can effectively urge users to perform your desired actions. The homepage also comes with a professional-looking contact form, so visitors can quickly reach out to you. You also get a cool gallery to show off your best beverages, a filterable portfolio, customizable typography, multiple color options, and custom widgets to easily add elements to your website. And thanks to the user-friendly theme customizer, styling the theme to match your preferences will be a breeze. 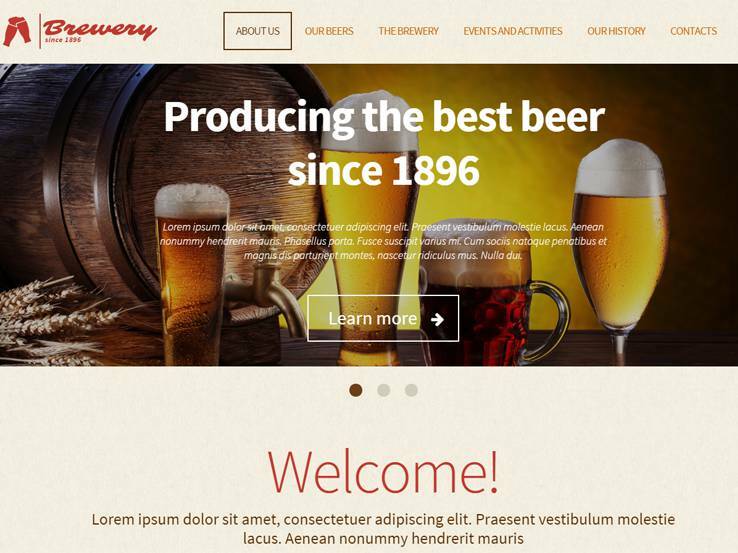 The Brewery Business Theme is just what the title implies: A theme developed just for breweries that would like to run a successful business as well. The theme has a strong focus on a clean design. The theme is fully responsive and tons of white space puts the focus on your content. The logo sits towards the center of the header, which can be swapped out for your own on the back-end. The homepage slider isn’t anything advanced, but it offers a sleek look into your top photographs. Provide close-up shots of your beer and don’t forget to include some pictures of your patrons having a good time. The Brewery Business theme is primarily run with widgets, so you can easily add a list of services or products right on the homepage. These have thumbnail images, descriptions, and links to the larger versions of website pages, improving your user experience and showing search engines your content is well-organized. The latest news widget is a must-have as well since it’s connected directly to your blog to keep people around for a longer period of time. Use the blog to talk about things like events, new products, and promotions. You can even share information about the history of your bar or brewery and describe your beers in detail by utilizing many post and page formats. Overall, much of the Brewery Business is setup to customize it on your own. Create a page with images from the bar or simply create a few pages explaining the history of your bar. The designers did well with this theme because running a bar is a full-time job as it is so you don’t have to worry about finding the time to update and manage your website. 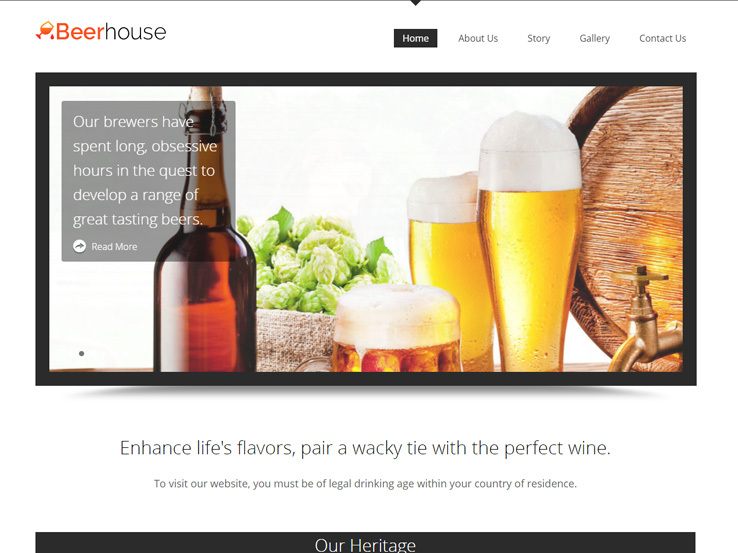 The Beerhouse WordPress theme is a great choice for those brewery and bar brands that want a more colorful, playful look. The fully responsive theme gives your customers a chance to check-in on promotions, events, and specials, all through the comfort of their mobile devices. This theme is easy to use and customize and it has colorful elements that you can change to meet your own branding needs. The powerful admin panel lets you customize the movement-based slider presentation since it allows you to add high-resolution images, overlaying text, and buttons. All of these elements are ideal for sending people to other pages on your website since you can grab their attention from the start and keep the traffic flowing to other, more important parts of the site. The logo sits to the left side of the header, while the menu is located just to the right. Include a tag line towards the top of the homepage and talk about your heritage using beautiful images and descriptions of your journey to becoming a company. Your story can also be highlighted on the blog since the theme has a recent posts widget for distributing your content. We like the client testimonial modules since you don’t necessarily see that much on bar websites. These are helpful for showing why other customers go to your establishment, weeding out those who may have a bad time. Quite a few widgets are available for the homepage. Social media buttons are ready to be added. They come with options for anything from Facebook to Pinterest, boosting the strength of your overall social strategy. Use the search bar to keep people on the right track and type in your contact information so visitors can easily get in touch with you or find your physical location. The gallery post type is easy to create and it helps you show how fun it is to come and have a drink at your bar or brewery.